The existence of a right of "public access to government-held information" has been described as a necessary feature of a democratic state, and exists in various forms in Sweden, the USA, France, Canada, Australia and New Zealand, but not yet in the United Kingdom. This book is not merely another plea for more "freedom of information" in the United Kingdom: it provides an explanation of the implications of such a right, drawing attention to the inevitability of substantial exceptions to it and to the importance of the precise language in which these exceptions are framed. No other book has yet been published which gives an impartial and up-to-date coverage, with attention to the legal language and techniques employed, of the most significant schemes of access in force in other countries. Nor has a comparably detailed survey been made in any other book of various Bills aiming to introduce such a right in the United Kingdom. Previous studies in the United Kingdom of access systems have especially emphasised the example set by Sweden and the United States. 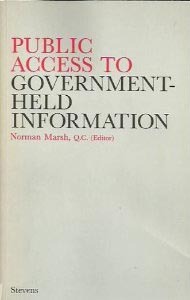 A valuable feature of "Public Access to Government-Held Information" is that it provides a very full description of the systems of public access now in operation in Canada, Australia and New Zealand whose governmental framework and political traditions are broadly similar to those of the United Kingdom. The book is essential reading for teachers and students of law and political science who seek to understand, for practising lawyers and officials who have - or may have - to operate, and for legislators concerned with the framework of systems of public access to government-held information. "Public Access to Government Held Info"